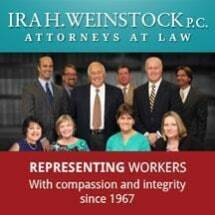 At Ira H. Weinstock, P.C., we have more than 100 years of experience protecting the rights and interests of clients across a variety of practice areas. Whether you have been injured in a work-related accident, wish to pursue Social Security Disability benefits, or have been discriminated against by your employer or a potential employer, our attorneys will explain your options, provide support and representation, and vigorously seek justice on your behalf. Three of our attorneys are certified specialists in the practice of workers' compensation law by the Pennsylvania Bar Association's section on workers' compensation law as authorized by the Pennsylvania Supreme Court. Furthermore, our firm has been recognized by Best Lawyers in America, Pennsylvania Super Lawyers and Martindale-Hubbell for its dedication in representing injured workers and labor unions. We have also been recognized by our former and current clients for providing attentive and effective services. We encourage prospective clients to meet with us, learn about our practice, review our client testimonials, and experience the difference of working alongside our professional attorneys and staff. The law office of Ira H. Weinstock, P.C., is located in Harrisburg, Pennsylvania. We are licensed to practice in all state courts in the Commonwealth of Pennsylvania and the federal District Courts for the Eastern, Western and Middle Districts of Pennsylvania. We are also licensed to practice before the 3rd Circuit Court of Appeals, the Federal Circuit Court of Appeals and the U.S. Supreme Court.